This morning, I woke up early to run. If you’re like me, that idea probably doesn’t appeal to you. I have been thinking about working out in the mornings before work ever since I bought my treadmill earlier this spring. It has taken many months before I actually ran before work, and this morning was my first time. I use to make excuses for not working out in the mornings. I was afraid that I would be even more tired after my workout than I already was, but in fact; I felt better. I’m not going to go as far as to say that I had more energy after one morning of exercise, but I did feel more alert. It also felt really good to know that I already had my workout taken care of for the day. This is my second week getting back in to running after taking two months off. This week I am running for a half mile, walking a quarter mile and running the final quarter mile to complete a full mile three times this week. I am working my own plan to ease me back in to running, and so far it has been going well. My legs wanted to stop running at a quarter mile this morning, but I continued on. 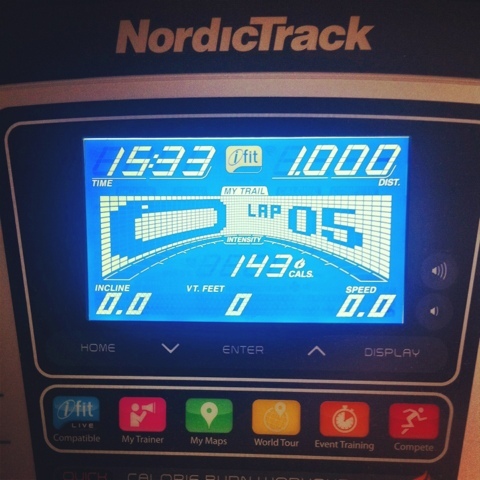 I ran at a slower pace, which did help me keep up with the distance of a half mile. Last week I was running a quarter mile every other lap to complete a mile. I feel like this is a good progression. Next week I am thinking about continuing this current routine, and will try to run for a complete mile without stopping at least once. My next 5K is on August 17th in Buffalo, New York. I am really excited because this will be my first Color Run! I am really nervous because this will be my third 5K and I think I am going to do a worse time than my first one; reason being, I starting training late. I am actually going in to this 5K with the idea of it being a “Fun Run”. I’m not sure if the Color Run is even a timed run, so I need to get that idea out of my head. It’s hard for me to not worry about time because that’s what motivates me to keep running. I enjoy beating my own time. It will be interesting to see how I do when I’m not running for time. Color Runners: is the race timed? Runners: what motivates you to run? I just did a Color Run in the beginning of July and it was not timed. It was SO much fun. I wish I would have taken more pictures or had more taken of me! This was my 1st 5k so I was nervous about it but once you get there it is so lively and upbeat and just plain FUN. You'll do great and have a blast.